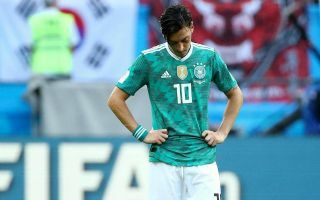 Arsenal playmaker Mesut Ozil has been on the end of a scathing attack from Bayern Munich president and Germany legend Uli Hoeness. This comes as the Gunners star has strongly hinted at a retirement from international duty with the German national team – at least for as long as he feels discriminated against for his Turkish origins. Ozil explained his reasoning in a lengthy statement on his social media pages, explaining that he feels victimised and like the victim of racism over his Turkish heritage. Long regarded as one of the best players in the world, Ozil is often something of a scapegoat when things don’t go well, with many pundits seeming to expect him to do things that aren’t really part of his game – such as charging about box to box or scoring tons of goals. The 29-year-old’s creativity is rightly lauded when things go well for his teams, but this languid style of play often seems to count against him somewhat unfairly as people use it to label him as simply being lazy. Hoeness is the latest to jump on that bandwagon as he hits out at Ozil following his retirement message with a strongly-worded quote in Bild. “I am glad that this scare is now over. He had been playing s*** for years. He last won a tackle before the 2014 World Cup. And now he and his s***** performance hide beyond this picture.